Low Employee Engagement Scores? Here’s What To Do. So you ran an employee survey and your engagement scores aren’t so hot. What should you do next? Here’s a step by step plan for addressing low employee engagement scores. A lot of companies struggle with keeping employees happy, aligned, and motivated. It’s no small task, but there’s hope. The fact that your team feels comfortable responding openly and honestly says a lot of good things about your culture. There is a foundation of trust that not all companies have. It’s also very telling that you are committed to better understanding your employees by creating surveys, sending them out, reminding people to complete them, and compiling results. This is no small task and it’s the first step to improving employee satisfaction and morale. Take a moment to thank everyone for responding to the survey. You don’t have to get into specific problem areas or results. Your goal is to be thankful and transparent without unnecessarily worrying. Be direct that you value their time, their words, and their feelings. This will help them feel heard and instill confidence that the results are being taken seriously and you’re working hard to address low engagement scores. Most people look at employee engagement as a way to reduce employee churn. While this is a benefit, the real value creation materializes on increased productivity. 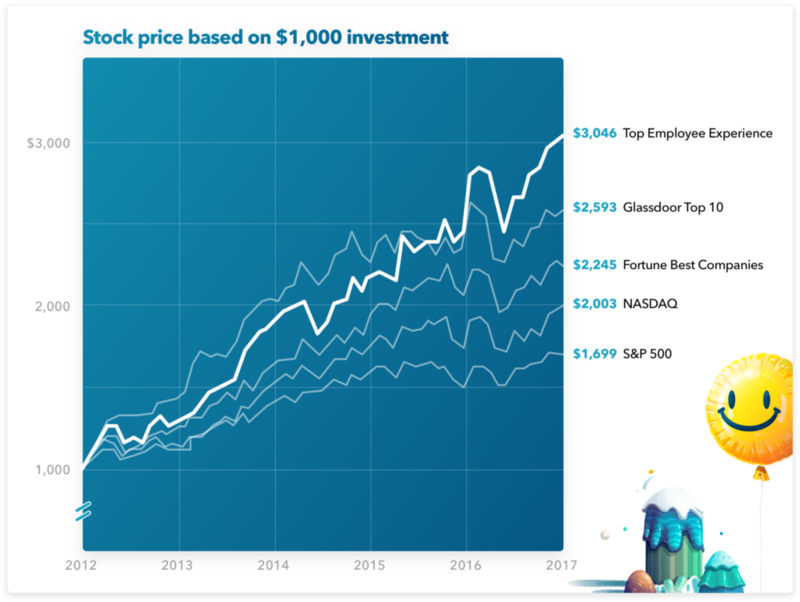 According to Harvard, companies that invested in employee experience saw a 3x return on their investment reflected in their stock price over a 5 year period compared to companies that didn’t invest in employee engagement. It is daunting to be chartered with “make our employees happy.” We’ve found that most companies have a lot of cultural champions who would be happy to help tackle projects whether it’s part of their job description or not. Start a #culture channel and invite your HR peers, leadership team, and managers. Ask for 3–5 people who want to dedicate time to cultural experimentation. Depending on the size of your team, it’s important to understand how many initiatives you can take on AND how many changes you can afford to make in your organization at once. You — Keep it up! Executive sponsor — It’s important to get support and input from the top. This can be a founder who cares deeply about culture or an executive who needs to be bought in on engagement strategies and budget. Marketing manager — Think of your employees like your customers. Having a marketing person in the room can help craft, brand, and execute your experiments in a way that is exciting to employees. Product or data expert — The whole point is to run far more experiments and gather data quickly. You’ll want an extra pair of eyes to help sort through the data and help determine what is working and what isn’t. 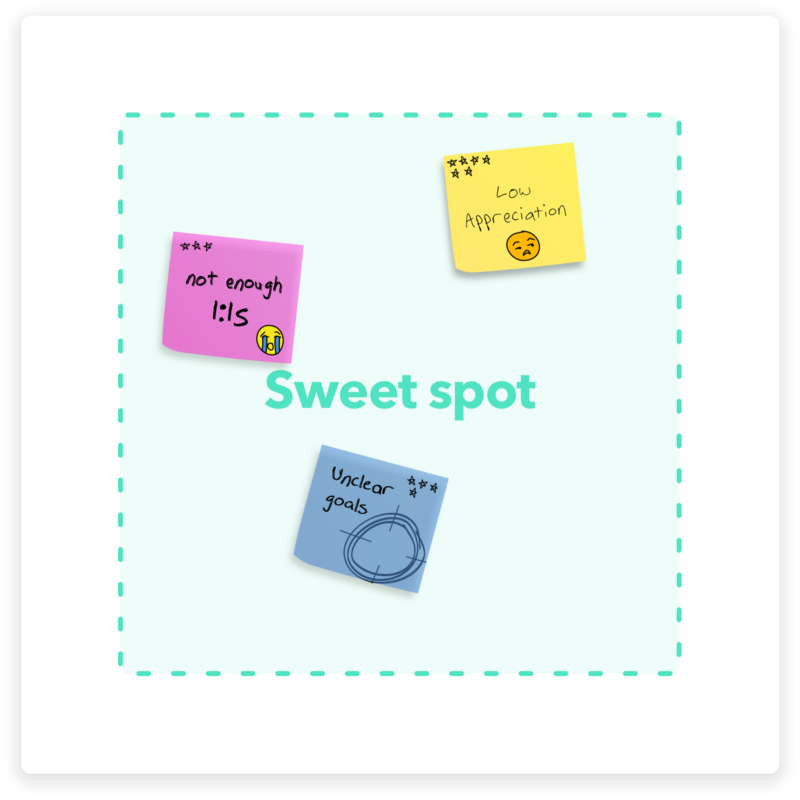 HR counterpart — It’s likely that you’ll test across a few employee touchpoints (hiring, performance reviews, surveys). Having multiple HR stakeholders participate will make it easier to test quickly. Your goal is to build well-rounded team of Culture Hackers. Culture Hacking is applying lean startup methodologies to culture. It’s a state of mind that views employees as your customers. Your job is to learn as quickly as possible what prevents employees from being engaged and to fix it. Companies like Airbnb & Salesforce are having wild success with it, and we’re going to share how you can to. 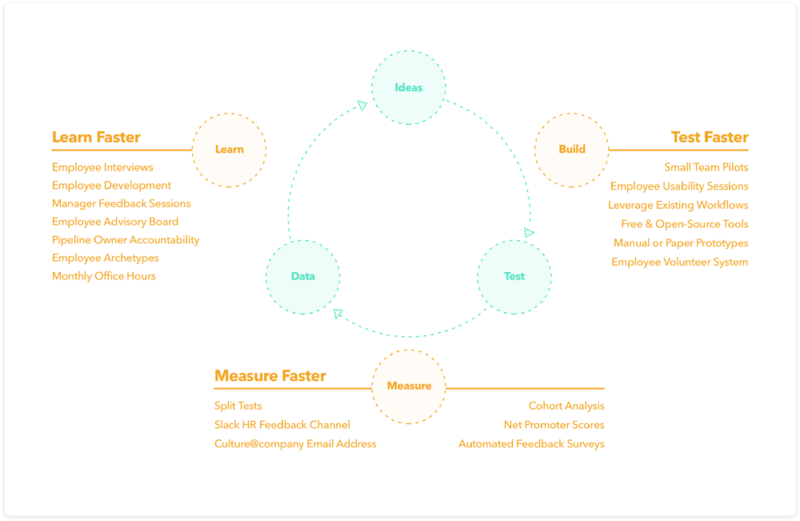 The core pillars of Lean Culture are generating ideas, running experiments, and analyzing data. Your goal is to minimize the effort & time it takes to go through these loops to get to your desired goal or KPI as quickly as possible. If you recently ran an employee engagement survey, you’re at the early stages of learning where to focus. We’ll talk next about using the data to diagnose opportunities, generate hypotheses, and outline tests to run. Depending on the questions asked in your survey and the survey provider (Google Forms, SurveyMonkey, CultureAmp, etc), you’ll have a wide range of valuable data that will allow you to uncover meaningful insights with regards to where the Culture Committee should spend their energy. If your Culture Committee has someone who is comfortable with analyzing data and finding trends, then uncover the top 2 or 3 problem areas the survey uncovers. There are bonus points for pulling in legacy survey data as well. Sometimes the trend of a particular question is more important than a snapshot in time. Examples of key insights: Are you consistently low on employee engagement quarter over quarter? Or did you have a hard Q1 due to a product outage or similar one-off hardship? Exercise caution when sharing survey data with anyone at your company. Be sure to remove all PII (personally identifiable information) when sharing the raw data or summarized insights. Team level data is appropriate if the team is larger than 5 people. But what are we looking for? 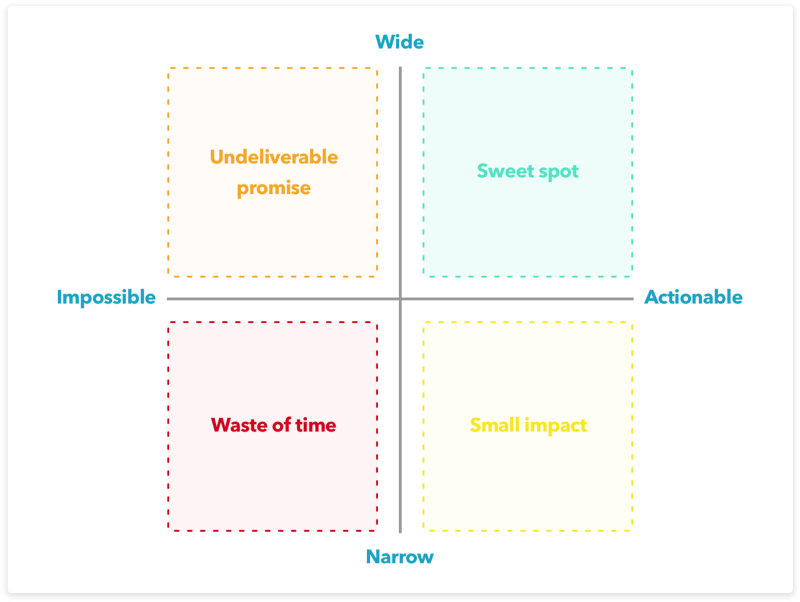 When you’ve come up with a list of themes from your survey, prioritize the ones that have wide exposure (affects a high percentage of the organization) and are actionable (you can quickly think of two to five experiments to address these issues). Disco is a celebration company after all, so take a moment to appreciate the teams, functions, or people that are doing well. If your organization is aligned on your company values, for example, make a note to celebrate it with the team. Depending on the scale and importance of the achievement, you might consider hosting a celebratory party, happy hour, or dinner. Now that you’re aligned on a focus area, it’s time for the fun to start; brainstorming. Schedule a 1–2 hour meeting with the Culture Committee. Write a problem statement (or generate one together) from the employee’s perspective. This is the problem you will attack in the brainstorm. Hypothesis — The hypothesis is what we’re testing. It must be a clear statement that is falsifiable. KPI — The metric is what we will measure in order to invalidate that hypothesis. That data can be quantitative or, in some cases, qualitative. Plan — The plan is a clear description of the steps we must take to gather that data. Timeline — It’s important for us to constrain the amount of time the experiment will run to keep us moving fast. Results — Clear metrics that prove or disprove your hypothesis. Here is a sample experiment sheet to help structure and track results. Share the area(s) the Culture Committee has decided to attack with the leadership team and broader company. Give a preview of some of the experiments you plan on running. Set the expectation that not everything will work, but with their help, you can start attacking some of the weaknesses together. This framing builds trust and excitement that employees are being heard and there’s proof that actions are being taken to address their concerns. Recently concluded experiments — Look at the KPI and decide if the experiment was a success, failure, needs more data, or needs another iteration. Recently launched experiments — Make sure recent tests are running smoothly. If the early metrics are great (or terrible) it’s ok to adjust on the fly (accelerate a rollout or stop it if it’s performing poorly). 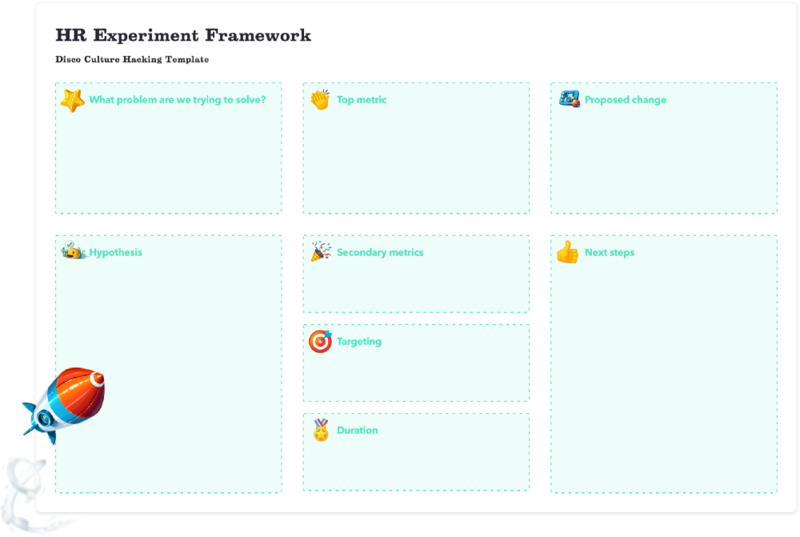 Upcoming experiments — Ensure that each upcoming experiment has a clear owner, hypothesis, KPI, and no audience overlap (to prevent confusion with your employees). In the case of low recognition, you can send a one-off survey to prove or disprove your hypothesis. In the case of Disco, those same surveyed teams saw a 105% increase in reported recognition. Be sure to share and celebrate the successes and failures of the experiments with the Culture Committee & the broader company. This will show the entire company that you are committed to addressing their issues and provide a ton of visibility into the great work that is being done. You’re on a great path toward improving the cultural alignment and health of your company. Please check out our experiment inspiration that address the most common reasons employees aren’t engaged in their job. Send us your experiment ideas! We will constantly update this post with the most successful or interesting experiment ideas. Email them to veronica@justdisco.com.